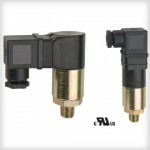 Pressure switch for control and regulation of all fluids and non-explosive gases. Suitable for compression plants, boilers, tanks, autoclaves, ventilation plants, lubrication plants. These switches feature a visual scale and adjustable hysteresis. A leading supplier in a wide variety of high-quality components, Application Engineering offers a range of pressure switches, suitable for a multitude of applications across industries. Our comprehensive selection of single pole double throw pressure switches (SPDT pressure switches), include options for every requirement, from our affordable MCA/MCS adjustable pressure switch with SPDT contacts, to our rugged PS75 cylindrical type pressure switch, for reliable operation under extreme pressure surges. As with all of our switches, transmitters and valves, the SPDT pressure switches we supply are all tested to ensure the very best in durability and quality. Many of these switches are also available in DPDT option, and are adjustable at factory or in field. Our specialist technicians are on hand to provide any advice or recommendations you may need while choosing the best pressure switches for your application – simply complete the contact form on this page, or call us today, on 01825 764737. Single pole double throw switches feed power from a single source into two separate circuits. The break-before-make action can be actuated using a toggle, button, or in the case of the products above, a pressure sensor; triggering a change in circuit one a pre-set pressure is detected. Where is a SPDT switch used? SPDT switches are used in any circuit (or circuits) where one switch is required to power conflicting actions. In some cases, it may be used as an on/off switch, but they are more suited to switching between circuits that do not need to run at the same time. For example, to switch between power sources (with a momentary lapse in power as the circuit breaks), or to switch equipment between “standby” mode and “active” mode. The precise implications of this vary according to the circuit composition, but SPDT switches are commonly found in domestic appliances, the automotive industry and heavy equipment, as a safety feature. How does a single pole double throw switch work? A single pole double throw switch is a break-before-make changeover switch; connecting a common source to a normally closed (NC) port, or a normally open (NO) port. Whether using a toggle, a timer, a button or a pressure sensor, the two circuits are isolated from each other until the switch is actuated.